The function in the algae of this quantum effect, known as coherence, remains a mystery, but it is thought it could help them harvest energy from the sun much more efficiently. Working out its role in a living organism could lead to technological advances, such as better organic solar cells and quantum-based electronic devices. It is part of an emerging field called quantum biology, in which evidence is growing that quantum phenomena are operating in nature, not just the laboratory, and may even account for how birds can navigate using the earth's magnetic field. 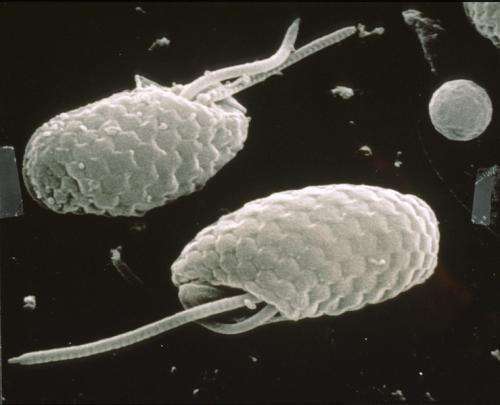 "We studied tiny single-celled algae called cryptophytes that thrive in the bottom of pools of water, or under thick ice, where very little light reaches them," says senior author, Professor Paul Curmi, of the UNSW School of Physics. "Most cryptophytes have a light-harvesting system where quantum coherence is present. But we have found a class of cryptophytes where it is switched off because of a genetic mutation that alters the shape of a light-harvesting protein. In the weird world of quantum physics, a system that is coherent – with all quantum waves in step with each other – can exist in many different states simultaneously, an effect known as superposition. This phenomenon is usually only observed under tightly controlled laboratory conditions. So the team, which includes Professor Gregory Scholes from the University of Toronto in Canada, was surprised to discover in 2010 that the transfer of energy between molecules in the light harvesting systems from two different cryptophyte species was coherent. The same effect has been found in green sulphur bacteria that also survive in very low light levels. "The assumption is that this could increase the efficiency of photosynthesis, allowing the algae and bacteria to exist on almost no light," says Professor Curmi. "Once a light-harvesting protein has captured sunlight, it needs to get that trapped energy to the reaction centre in the cell as quickly as possible, where the energy is converted into chemical energy for the organism. "It was assumed the energy gets to the reaction centre in a random fashion, like a drunk staggering home. But quantum coherence would allow the energy to test every possible pathway simultaneously before travelling via the quickest route." In the new study, the team used x-ray crystallography to work out the crystal structure of the light-harvesting complexes from three different species of cryptophytes. They found that in two species a genetic mutation has led to the insertion of an extra amino acid that changes the structure of the protein complex, disrupting coherence. "This shows cryptophytes have evolved an elegant but powerful genetic switch to control coherence and change the mechanisms used for light harvesting," says Professor Curmi. The next step will be to compare the biology of different cryptophytes, such as whether they inhabit different environmental niches, to work out whether the quantum coherence effect is assisting their survival. My ESP powers preview the next wave of pseudoscience mumbo-jumbo "Healing through quantum biology"... and just wait that an idiot such as Deepak Chopra reads this. Interesting take. I would think that something as fundamental to the nature of the universe and how it works (which has been shown over and over via scientific inquiry) as quantum mechanics would absolutely have a deep cause and effect relationship with biology which follows rules based on rules of quantum mechanics. De novo creation of olfactory receptor genes is only possible in the context of quantum mechanics, not mutations and evolution. How so JVK and anon?? JVK doesn't believe in evolution, and has a very wacky theory about how the various species got here. Basically, a total crackpot to be ignored. There's no reason mutation/NS and quantum effects are incompatible. @johnhew: Since 'mutation' as commonly used and defined in biology means a change in genome base-pair sequence, new genes (whether de novo creations or alterations of existing genes) are BY DEFINITION 'mutations'. JVK has had this pointed out to him many times, but acknowledging this would force JVK to admit that his statement that mutations are never selected for is wrong, and he's not honest enough to admit his mistakes. Instead he ignores or insults anything that disagrees with him, whether it is experimental evidence, how words are used in a field that he claims to be an expert in, or other commenters. And as far as quantum mechanics goes, JVK is so clueless that he thinks he needs quantum mechanics to understand the difference between changes in gene sequence and changes in gene expression. That's as silly as not understanding the difference between changing 'pray' to 'play' versus saying 'pray' three times instead of once without starting with Chomsky's universal grammar. there is another reason that I think you should consider carefully what jk says... His model that he posts about ad nauseum specifically causes mutations, and yet you will notice that he is extremely anti-mutation. Follow jk's comments and watch how he posts... he is here to drum up support for his perfume "scent of eros" as well as push his model which he believes supports his creationist/xtian religion. "If a man does not know what he is talking about with regard to his fields lexicon, then he doesn't know what he is talking about!" At the end of the day it isn't what you believe to be true but what you can prove to be true. So far, despite writing thousands of lines of comments, you haven't proved anything other than you like to write comments ad nauseum. PZ Myers and most evolutionary theorists want chromosomal rearrangements to be excluded and mutation-initiated natural selection to continue to be represented in the context of the evolution of biodiversity. Simply put, they want what we detailed in 1996 to be dismissed so that they can continue to tout pseudoscientific nonsense. From Fertilization to Adult Sexual Behavior http://www.hawaii...ion.html "ZFX and ZFY are described as "DNA-binding proteins" and via their binding of sexually dimorphic proteins, chromatin structure and transcription could be modulated in sexually dimorphic ways as a result of females having only ZFX binding events..."
Does anyone else read the current extant literature on cell type differentiation in species from microbes to man? Is it not nutrient-dependent and pheromone-controlled via epigenetic effects that enable ecological adaptations? is already accepted as part of evolution BECAUSE IT CAUSES MUTATIONS and you proved it already. stick to the facts. Evolution Theory is true, and it works. Your arguments are invalid as your denigration of mutation also denounces your own model. As you know, "The genetic and biophysical mechanisms by which new protein functions evolve is a central question in evolutionary biology, biochemistry, and biophysics." "...explicit studies of protein structure and dynamics..." show how a "...shift in function was driven primarily by two historical amino acid changes..."
The amino acid substitutions are nutrient-dependent and pheromone-controlled in my atoms to ecosystems model, which cannot be discussed because anonymous fools and idiot minions of biology teachers like PZ Myers have no clue about what needs to happen with hydrogen bonds to achieve biophysically constrained thermodynamically controlled seemingly futile cycles of protein biosynthesis and degradation that enable organism-level thermoregulation manifested in biodiversity. If you can eliminate the idiots here, progress might be made. well, I know that some people ARE trying to get you banned, so... it would be much easier if you just left and stopped posting pseudoscience though! then all the idiots would be gone! Everything known about the photosynthetic, micronutrient, and macronutrient pathways that link ecological variation via base pair changes to ecological adaptations shows that mutations perturb the protein-folding that is required for niche construction to result in increasing organismal complexity via amino acid substitutions. "The origin of homochiral amino acids and sugars is assessed. The integrated development of the Universal Genetic Code in shown in eight steps. Mutation rates limited the sizes of early nucleic acid genomes to about 200 bases." Achiral glycine links the nutrient-dependent pheromone-controlled stabilized genomes of yeasts and mammals via the conserved molecular mechanisms of amino acid substitutions. Couldn't agree more, when are you leaving? Are you trying to tell others that achiral glycine does NOT link the nutrient-dependent pheromone-controlled stabilized genomes of yeasts and mammals via the conserved molecular mechanisms of amino acid substitutions that also link light as a nutrient source to the quantum biology of consciousness? Or are you just someone's idiot minion? As has been pointed out to you numerous times, JVK, amino acid changes ARE MUTATIONS. Base pair changes ARE MUTATIONS. Amino acid substitutions ARE MUTATIONS. We've been through the definition of 'mutation' before - do you need to have it explained to you yet again? RealScience apparently wants others to believe that light as a nutrient source causes mutations that somehow lead to natural selection and the evolution of biodiversity. Clearly, Dobzhansky, who claimed to be a Creationist, may have been one of the first to "see the light" and to almost recognize it as a nutrient source that led from ecological variation in algae to the ecological adaptation of consciousness in the universe via the sense of smell. "This strong connection between structural biology and physics means that ultrafast light-harvesting functions are under genetic and evolutionary control." However, what is currently known about biophysically-constrained ecological adaptations informs intelligent people that constraint-breaking mutations lead to perturbed protein folding, and the perturbations do not lead to the de novo creation of any novel receptors that could contribute to nutrient-dependent pheromone-controlled receptor-mediated behaviors. For contrast: "The great diversity of solutions to light harvesting in the cryptophyte algae, in particular the combination of different chromophores and significantly different structural combinations, are quite extraordinary." Given the need for nutrients, the diversity of structural combinations cannot result from mutations that perturb stability via nutrient-dependent amino acid substitutions. "The ancestral cryptophyte alga acquired its chloroplast by engulfing and taming a red algal endosymbiont, which would have had at least a primitive phycobilisome (7, 24)." That suggests a nutrient-dependent ecological adaptation to me. Who thinks "...engulfing and taming a red algal endosymbiont..." is an example of mutation-driven evolution? How can anyone be that ignorant when it comes to biologically based cause and effect? You don't need to believe in the neo-Darwinian theories that were invented and defined to fit what RealScience thinks is known. You need only compare what people like that think to the biological facts. How else could quantum consciousness arise if not by ecological adaptations? >Clearly, Dobzhansky, who claimed to be a Creationist, may have been one of the first to "see the light" and to almost recognize it as a nutrient source that led from ecological variation in algae to the ecological adaptation of consciousness in the universe via the sense of smell. You're saying that consciousness exists because we can smell light? I'll explain your own references to you yet again, JVK. of ever-new combinations of these letters. The environment includes nutrients, and new combinations of DNA's 'letters' are mutations BY DEFINITION, so your Dobzhansky reference disagrees with your both your pet theory of controlled nutrient-dependent genetic changes AND your claim that mutations don't contribute to evolution. Your reference goes further against you than anyone commenter here has, saying that ALL evolution is such sequence changes (it pre-dates epigenetics). See the extended discussion of biological facts compared to the pseudoscientific nonsense of evolutionary theory. Join the group and try to comment intelligently in either of the two threads about how light acts as a nutrient to induce changes that lead to amino acid substitutions that differentiate cell types. @JVK - experimental evidence against your hypothesis that mutations are never selected for has been presented to you, and you have ADMITTED that you ignore such evidence. And you have also ADMITTED that you have no experimental evidence to support your hypothesis. To insist on something that goes against the evidence is pseudoscience. Please stick with your facebook discussion and stop posting your pseudo-science on this science site. 1. Light is an energy source, but not a nutrient. Why do you feel the need to keep redefining terms others have established? 2. I may have missed a citation somewhere, but what suggests light causes amino acid substitutions? If it somehow causes codon changes at the DNA level (although only UV light and above are able to cleave bonds), then it's still defined as a mutation. So preach away, mensa boy. your model causes mutations and is a part of Evolution theory! "...a structural switch controlled by an amino acid insertion to modulate excitonic interactions and therefore the mechanisms used for light harvesting." in a selective advantage for the algae—for example, is coherence important for efficient light harvesting?" Amino acids are fixed in the DNA of organized genomes if they benefit orgnanism-level thermoregulation. Mutations are typically eliminated if they perturb protein folding that benefits orgnanism-level thermoregulation. The mutations are linked to pathology; the amino acid substitutions are linked to increasing organismal complexity in species from microbes to man. "The emergence of two forms appears to have been caused by a single insertional/deletional mutation in the new cryptophyte α subunit. Great - I don't have to point out the the reference supports mutations being involved in evolution because you have done so yourself - maybe there's hope for you yet! the amino acid substitutions are linked to increasing organismal complexity in species from microbes to man. So much for hope. What part of the standard definition of mutation, "a change in DNA sequence" did you fail to understand? I'll repeat it for you again: amino acid substitutions are DNA sequence changes, and hence they ARE mutations, by definition. Are you saying that light-induced amino acid substitutions are evidence that the quantum physics of sunlight causes the quantum biology that links photosynthesis in plants to nutrient-dependent pheromone-controlled MUTATIONS that differentiate the cell types of all individuals of all species from microbes to man? I'm saying that serious scientists should substitute ECOLOGICAL ADAPTATIONS for "MUTATIONS." If you do not agree, please tell us where to find the definition of mutation that you are using. I would like to know what kind of idiot encourages you to tout that pseudoscientific nonsense as if inventing a definition was the means to explain anything about quantum physics or the quantum biology of biophysically constrained ecological adaptations. I'm saying that serious scientists should substitute ECOLOGICAL ADAPTATIONS for "MUTATIONS." Serious scientists used mutations to mean "amino acid sequence changes". Some mutations are ecological adaptations, but most are either non-adapative or maladaptive. Some ecological adaptations are mutations, while others are epigenetic changes and others are temporary gene expression changes, and yet others are alternative splicing changes, etc. please tell us where to find the definition of mutation that you are using. Are you pretending that you haven't already be given this several times? For example, in http://phys.org/n...ars.html you asked for the source of the definition and were given FOUR sources. Biology Online: A permanent, heritable change in the nucleotide sequence in a gene or a chromosome (http://www.biolog...tation). Note the definition: "a mutation is defined as any alteration in the DNA sequence"
Thanks, I had forgotten how many citations attest to the pseudoscientific nonsense of population genetics. Do any of the claims come with experimental evidence of how the mutations are linked to the evolution of biodiversity by natural selection or any other additional nonsense about biologically-based cause and effect? Nei wrote that "Selective advantage of the mutation is determined by the type of DNA change, and therefore natural selection is an evolutionary process initiated by mutation." He did not write anything about how the type of DNA change was naturally selected. I explained how ecological variation leads to ecological adaptations via amino acid substitutions. What implies the substitution was caused by light? Mutations are selected based on how the phenotype they result in performs. These were examples of the definitions of mutations. If you use the term to mean something other what real scientist in biology and genetics mean, it is hardly surprising that those in the field dismiss you as a crackpot. I happen to like non-mainstream thinking, but since you refuse to define what you mean by the term mutations, even I can't have a civil discussion with you. Do any of the claims come with experimental evidence...? Sure - Lenski is a good example of how this process starts. In contrast, do you have any experimental evidence yet of your claim that mutations are NEVER selected for? That was explained by Darwin, Russel, and others over 150 years ago, although they did not know the molecular basis of what was being selected (which includes at least gene sequence variations, regulatory sequences variations heritable epigentic variations). No you don't. You hypothesize THAT ecological variation leads to ecological adaptations via amino acid substitutions, but as *9001 and others point out, you don't explain HOW, in your comments or in any of your review articles. Since our genomes use lots of tricks and this would be a useful trick, it wouldn't surprise me at all if there are numerous ways for this to happen. But as the Captain points out, such substitutions fall within the standard definition of mutations. And as I have pointed out, even if controlled sequence 'edits' are common, it would NOT mean that our genome don't ALSO use location-specific but non-deterministic sequence changes and even almost-random sequence changes. I included examples of conserved molecular mechanisms that link Darwin's 'conditions of life' to nutrient-dependent pheromone-controlled ecological adaptations and I have since included more details about thermodynamics and organism-level thermoregulation that reintroduce the quantum physics that link light to amino acid substitutions in plants to ecological variation that links amino acid substitutions to cell type differentiation in all individuals of all species. The fact that I am still attempting to discuss the entirety of what is known about ecological adaptations with anonymous fools and idiot minions of biology teachers who taught them to believe in pseudoscientific nonsense attests to how pervasive that nonsense is. Clearly, it is easier to remain ignorant than to learn, which is why only the ignorant continue to challenge the facts I have detailed. If ever you read a comment on my work by a serious scientist who is not anonymous, let me know. Lenski, and others, have since moved forward from their ridiculous misrepresentations of what others decided must be mutation-initiated natural selection that enabled the evolution of biodiversity. Intelligent people realize how unlikely it is that these feedback loops would appear in the context of concurrent bottom-up (nutrient-dependent) and top-down (pheromone-controlled) ecological adaptations, which is why intelligent researchers are distancing themselves from us of the term mutations. What we see here is comment on my works from the unintelligent who don't read. Lenski and others are not denying mutations/NS like you keep insisting. Dobzhansky spent his entire career researching mutation/NS. He never denied it. I've pointed out ti you before that the majority of his publications concerned their role in evolution. Please describe the role you think mutations play in the context of concurrent bottom-up (nutrient-dependent) and top-down (pheromone-controlled) ecological adaptations, or in the context of the evolution of biodiversity via natural selection. Then try to support your description of biologically-based cause and effect with experimental evidence that does not assume that the organisms automagically evolved. "Our results demonstrate that mutant-HSC-driven niche damage critically contributes to disease manifestation in MPN and identify niche-forming MSCs and their neural regulation as promising therapeutic targets." This is the kind of thing that anonymous fools and idiot minions of biology teachers who taught them to believe in mutation-initiated natural selection think leads to the evolution of biodiversity. Ask them how that could be possible, and expect to get answers like "Lenski and others are not denying mutations/NS..." and "...the majority of his publications concerned their role in evolution." What's worse is that the anonymous fool [anonymous_9001] got me banned from participation on the human ethology yahoo group by asking me about the role of RNA, which I have detailed in my published works. Links nutrient-dependent atomic-level interactions via quantum physics and quantum biology to the de novo creation of olfactory receptor genes and to glycine receptors that stabilize the body's response to stimuli such as light and pain. Those classically-conditioned responses link nutrient-stress and social stress to ecological adaptations perturbed by mutations that prevent protein folding from resulting in the creation of typically differentiated cell types. Thanks George. Have you tried to publish this in a peer-reviewed journal? In the context of discussion here, your information seems far to valuable to go un-cited or linked only to internet publication. Indeed, if you are familiar with the works of Luca Turin, something citable might lead to collaboration with others who understand the links from quantum physics to quantum biology, which suggests -- as you have -- that they lead to an understanding of quantum consciousness. How would he get you banned by asking you a question? It seems far more likely that YOUR ANSWER got you banned. You are a counter-example - you work really hard at remaining ignorant. How many times have other commenters pointed out that amino acid substitutions ARE mutations? Well over 100 times, and you still ignore it. Or do you claim that amino acid substitutions are not DNA sequence changes? The ISHE group's moderator dictated the terms of my answer about RNA and made it impossible for me to address the anonymous fool's ridiculous question. http://www.nature...146.html includes the involvement of amino acid substitutions that specifically seem to alter clathrin and its downstream effects on brain development. The brain development is thereby associated with the microRNA/messenger RNA balance and Alzheimer's disease. That links light-activated amino acid substitutions to ecological, social, neurogenic, and socio-cognitive niche construction that is perturbed in neurodegenerative diseases associated with abnormal cell type differentiation -- and perhaps to quantum consciousness via perturbed learning and memory. Evolutionary theorists might like to attribute the amino acid substitutions to mutations that somehow enable natural selection and the evolution of biodiversity. But their ideas lack experimental evidence. "[W]hat Haldane, Fisher, Sewell Wright, Hardy, Weinberg et al. did was invent.... The anglophone tradition was taught. I was taught, and so were my contemporaries, and so were the younger scientists. Evolution was defined as "changes in gene frequencies in natural populations." The accumulation of genetic mutations was touted to be enough to change one species to another.... No, it wasn't dishonesty. I think it was wish fulfillment and social momentum. Assumptions, made but not verified, were taught as fact." Most of the comments here are from people who refuse to address any aspect of how the theory they believe in was invented and defined. They assume that the initial assumptions of population geneticists were based on experimental evidence and continue to tout pseudscientific nonsense. They are scientifically illiterate idiot minions and/or anonymous fools. So why did you try to blame your getting banned on _9001's question rather than owning that it was your answer that got you banned? Or do you claim that amino acid substitutions are not DNA sequence changes? You have been provided with multiple links that mutations are defined as DNA sequence changes. So either your previous statement is clearly wrong (in which case, let's see if you are honest enough to admit it), or you don't think that amino acid substitutions are DNA sequence changes. 2: think that amino acid substitutions are not DNA sequence changes. "Most of the comments here are from people who refuse to address any aspect of how the theory they believe in was invented and defined. They assume that the initial assumptions of population geneticists were based on experimental evidence and continue to tout pseudscientific nonsense. They are scientifically illiterate idiot minions and/or anonymous fools." Trying to dodge the question, JVK? How do you KNOW whether they REFUSE to discuss it, or whether, for example, they consider the origins of a theory less relevant than whether there is modern experimental evidence for that theory? Oh, you just ASSUMED it. How do you KNOW that that is what others assume when they haven't discussed their assumptions? Oh, you just ASSUMED it. So quit dodging the question. "Assumptions, made but not verified, were taught as fact." Once again, JVK, what you accuse others of is what you are actually guilty of yourself. You ASSUME that mutations are never selected for, but you have not verified it (you have admitted that you have no experimental evidence to support this assumption), and yet you claim that it is a 'biological fact'. Checkmate again - can't you at least find something new to be wrong about? Anyone who thinks there is anything wrong with my model of how ecological variation leads to ecological adaptations via nutrient-dependent pheromone-controlled reproduction should be able to tell me something about HOW mutations and natural selection lead to the evolution of biodiversity. The fact that no one can say anything except that random change might be a mechanism reveals how pitiful the pseudoscientific nonsense of neo-Darwinism still is -- more than 80 years after it was invented. No one here has disagreed with ecological variation leading to ecological adaptations via nutrient-dependent pheromone-controlled reproduction. What is wrong with your model is that you seem to think that this is the ONLY thing involved, and close your mind to everything else in evolution. That's from an article that YOU cited without even realizing that the article disagreed with you. As for "no one can say anything except..." you are ignoring the other score or so of your own citations that I have pointed out ALSO disagree with you, as well as Lenski, malarial resistance, etc. that have been pointed out to you. You even ADMIT that you ignore evidence that of mutations are selected for. "You even ADMIT that you ignore evidence"
What evidence? Why are you ignoring my request to tell me what is wrong with the evidence in my model but not offering experimental evidence of biologically based cause and effect for comparison? Do you prefer to ignore all evidence of epigenetic effects on cell type differentiation and continue to tout random mutations and natural selection -- while others also ignore the most important information on cause and effect that has ever been presented? I have NOT ignored your request. For example, your model claims that mutations are never selected for, I have pointed out REPEATEDLY that you have not yet presented any evidence, experimental or otherwise, that mutations are never selected for. And I have repeatedly pointed out evidence against that part of your model, for example Lenski's results and the distributions of sickle-cell alleles. Do you have ANY experimental evidence that mutations are never selected for by natural selection? If not, then stop claiming that it is a 'biological fact' and admit that it is just a hypothesis of yours. I haven't seen anyone here ever claim that cell type differentiation is caused by 'random mutations and natural selection', OR argue against epigenetic effects. You are the one who appears to thinks that nature only uses one technique, and that thus if nature uses controlled epigenetic changes for some things then it can't use mutations for other things. And that is in addition to your lack of understanding of the basics of the field; for example, your confusion between epigenetics and genetics, plus your continued lack of understanding that the term 'mutations' as commonly used in the field includes all DNA nucleotide sequence changes (and on top of that you refuse to define what you mean when you use the term 'mutations'). Here's another chance: please define what YOU mean by 'mutation'.